An Unequaled Course in Blue Water Catching! Get on board with some of Hawaii's top meat hunters as they explain how they rig for the ocean's top predatorsBillfish, Ahi, Aku, Mahimahi, Ono. Learn how they read and follow the birds to put more fish in the box. Then, once you've caught your fish, we'll show you the best way to cut it... plus HFN's single-most popular way to prepare and serve it. True Adventures on the High Seas from the files of HAWAII FISHING NEWS! 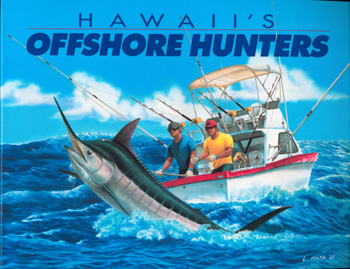 The best-kept secrets are revealed in this book gathered from the files of HAWAII FISHING NEWS making you a more successful "Offshore Hunter." Whether you're a novice cook or a gourmet seafood chef, you'll love the tempting simplicity of the more than 300 recipes offered in "Fresh Catch of the Day...from the FISHWIFE." An extensive array of Fishwife's Tips will guide you to successfrom choosing fresh seafood, to safe handling and preparation to innovative cooking in the kitchen and barbecuing and smoking seafood outdoors. 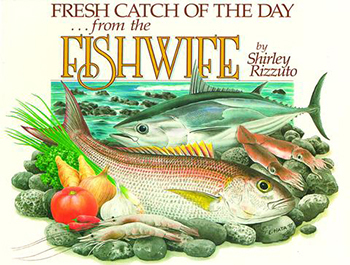 This, the second work of author and "Fishwife" Shirley Rizzuto, spanned the last decade of the 20th century. As we enter the next millenium, and increasing attention is given to healthy living for a longer life, scientists and dietitians predict we will turn more and more to the oceans of the world for healthy eating. With this in mind "Fresh Catch of the Day" will most certainly become a popular and necessary part of your culinary library. This book was motivated by my own curiosity about what is going on. Many fishermen feel that what they have learned is for their own benefit... The result is that all fishermen, both beginners and experts, pay the price. "An excellent guide to Hawaiian angling. It's written smoothly and accurately and contains information that applies anywhere in the world." "Jim Rizzuto was spawned as a Connecticut Yankee, yet he left those periodically cold shores to become a school teacher in the warm Sandwich Islands. Today, he is an erudite resident of Hawaii." "In this nice and instructive work, Rizzuto proves that he can teach sport fishing as well as grammar and spellingmaybe better! Illustrations are line drawings by Leslie Hata, and they are generally immaculate. The work is loaded with helpful how-to illustrations." 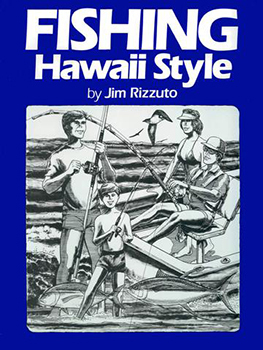 "Rizzuto adds spice to his narrative by referring to each fish and often each technique by native Hawaiian and Japanese names, but he qualifies with stateside Americanese and Latin." "This book is a worthy addition to any serious angler's library."